I had no idea that Raspberry Ruffle bars existed before I made these beauties. Thank you Google for letting me know, again, that I am not original. 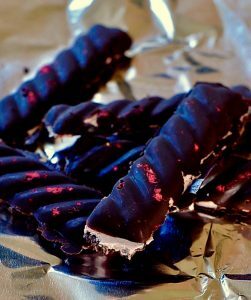 Here is the Ruffle bar description I found online “sweet raspberry flavoured coconut centre, surrounded by rich dark chocolate.” Yep that is just what I made except I packed in a ton of raspberries. 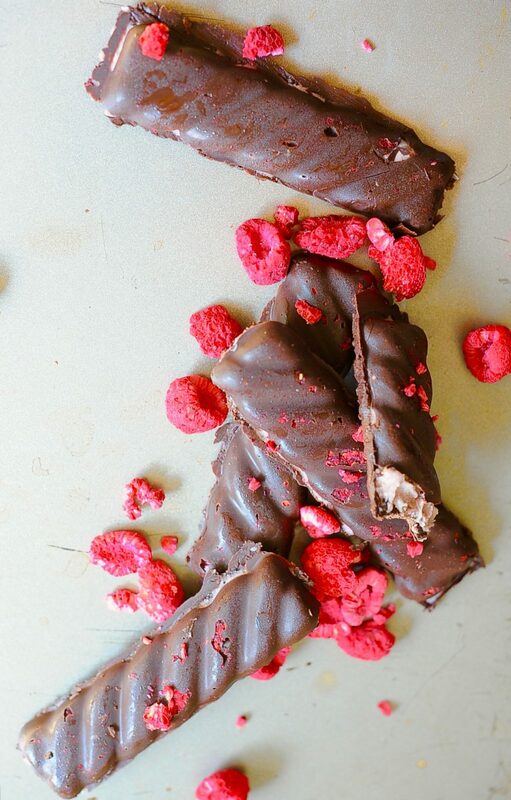 I was planning on making chocolate covered raspberry bon-bons when I heard a voice: uh Johanne, why struggle to make perfect little bon-bons when you can make bars, big bars that will take half the time?”. 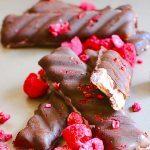 That voice in my head was making sense, good sense so I listened and came up with these coconutty melt in your mouth and in your hands bars of raspberry nougat. My inner voice only chimes in on the subject of sweets and has suggested the most diabolically genius spot to hide my stash of chocolate. The delicate oval leaves on our black raspberry bushes are turning with the season. Years ago we dug them up from our friend Judy’s garden and planted them tenderly in the fresh dirt of our backyard. As I write this I sip a mug of faintly sour raspberry leaf tea. That July day burns bright in my memory. Once or twice a summer family and friends would spend a day helping our aging friend keep up her property and therefore maintain her independence. A Yankee through and through Judy was no shrinking violet when it came to telling us what she needed done. Out came the list, and tasks were assigned all the way down to our kids aged four and eight. 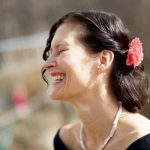 “Aylam” said Judy sternly kneeling in front of my four year old boy “go catch me a frog, and after that I need five earthworms”. He would nod gravely and toddle off on his quest. My mom and I donned our gauntlet glove and clippers and headed out to do battle with Judy’s black raspberry patch. Sitting on the ramshackle adirondack chairs after a day of beating back the ever encroaching brambles that threatened to overtake Judy’s 1700’s farm house, set in the big woods, we’d sip homemade lemonade and eat white bread peanut butter and jelly sandwhiches. Music flowed from the radio mingling with our laughter. The air smelled of sweat, bug spray and crushed raspberry leaves. 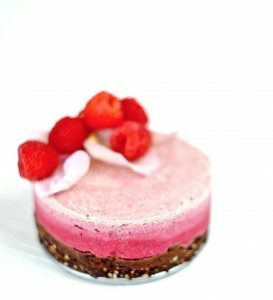 Raspberries make for the most elegant of desserts like my Raw Raspberry Rose Cheesecake that I made a s a goodbye to my daughter. Halloween is on its way. 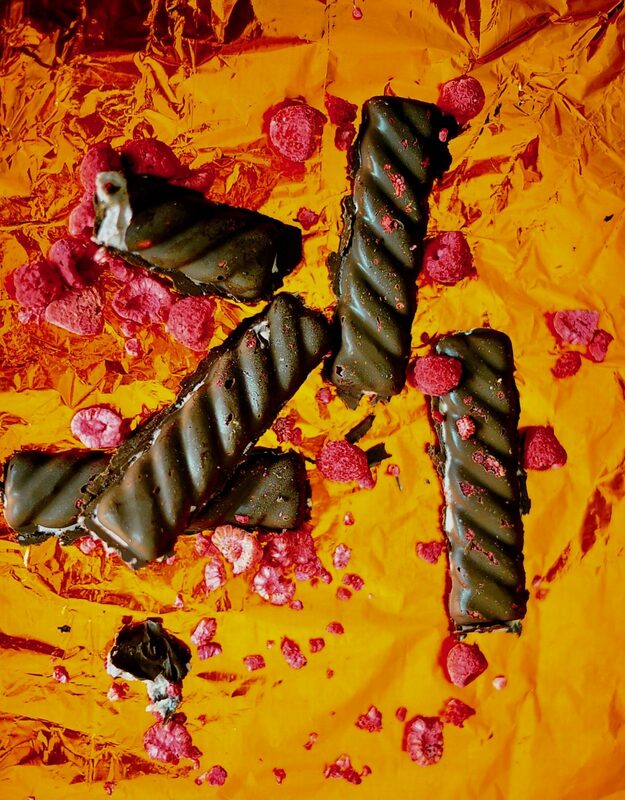 Celebrate by making a batch of these decadent chocolate bars filled with the most raspberry-licious cream centers. 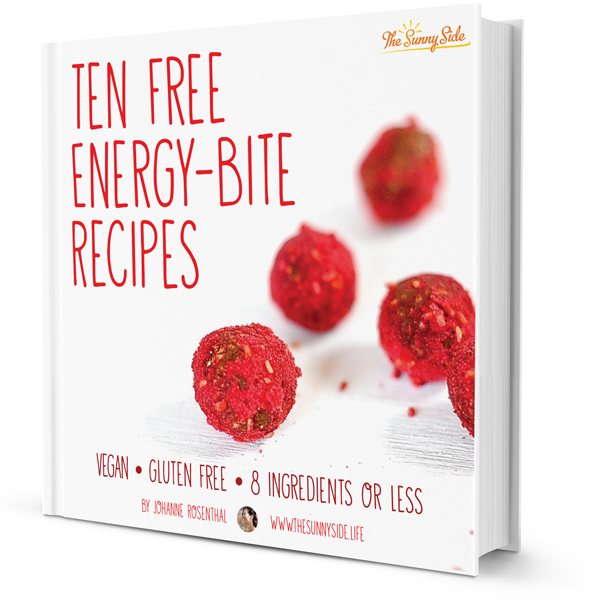 In a food processor blend your cashews, raspberries (not the freeze dried ones!) vanilla, maple syrup, melted coconut oil and enough of the plant milk to get a smooth paste. Mix the the freeze dried crushed raspberries through the mixture with a spatula. Place the coconut shreds into a shallow bowl. Chill the "dough" and once fairly solid, form them into sausage shapes about 3 inches log. Press the bottom of each log into the coconut shreds until the bottoms are fully coated. Melt your chocolate and dip each bar into the melted chocolate. Allow to set and garnish with more raspberries if you have. Disclaimer I obviously used molds. Amazon has many inexpensive plastic molds and they are so much fun to play with in the kitchen. I've made them without molds though and both methods work wonderfully. I had the pleasure of eating a few of these chocolate bars fresh out of the… Not oven (but you know what I mean). They might have been a little too good. Friends and chocolate a perfect evening. Now what does one cook for prison Break?? Three cheers for Judy! Your photo of your chocolate confections against the trippy yellow background: I want to print that out and frame it for my livingroom. I was searching through my Holiday baking supplies and I found a roll of candy wrapping foil. A good crinkle and it did make a fun backround. Thank god for old yard sale supplies. That was a wonderful day. Remember the snapping turtle? Even his snap was nothing compared to snapping one of these in half. That satisfying snap that gives way to smooth raspberry goodness. I do remember!!! He was a fearsome creature!